Most of last weekend I spent in a horizontal position, fighting my own mini-game of Jessica vs. the Strep Throat Bacteria. Luckily, after several rounds of ST KO’s I acquired the item ‘Amoxicillin’ and am currently on the mend. You would think that an extended weekend where FFXIII was at hand I would have practically conquered the game, but alas, I am still only 5 hours in. (See? I *am* trying.) It’s all right so far. I guess I forget that the first half of all the FF games are fairly linear… And since the story isn’t terribly exciting I’m not exactly a captivated audience participant. I do like the upgrade system-it’s interesting in an OCD kind of way-but every time I open up poor little Hope’s Crystarium the game freezes. I don’t know how to fix this and it might cause some epic problems later-unless the game lets him stay a level one forever. Maybe it will add to the challenge. And I would like to thank Square Enix for the addition of the Datalog. It’s nice knowing that when the politics of the game get unbearably confusing and full of one-word catch-all names that I can refer back to a summary of each chapter to bring myself up to speed. I mean who could possibly know the difference between a l’Cie, a Pulse l’Cie and a fal’Cie (honestly, I am still not too clear) without the reference guide? But no worries, there is plenty of time to hack n slash at random monsters and follow along with Snow/Lightning/Vanille (what’s with the white element theme anyway?) and the gang since the next games I am looking forward to don’t come out until May when Alan Wake and Lego Harry Potter are released. I will write more about FFXIII at a later date. Due to a friend at Blockbuster who is always willing to hold the new releases for us on Tuesday mornings, we also now have a copy of God of War 3. I won’t get a turn at this one for awhile because Matt wants to play it first (this is how gamer couples compromise), but after some peeks at the first level I am happy to see we are back in giant country. That is one art style/mechanic I love in video games oh so much. Something about seeing a Colossus makes me all warm and fuzzy. Maybe it’s because I know the associated (although fairly predictible, I admit) battles won’t only be a series of melee attacks but will also involve some QTE’s where the giant sweeps at you with his huge paw or screams at you through a cavernous mouth with glowing moon eyes. Usually these monstrosity’s are stoic and unyielding (the end of Devil May Cry 4 was AWESOME), which makes their presence so chilling. 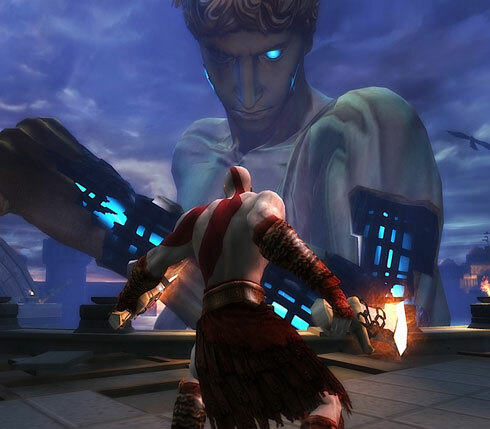 God of War II’s intro with the Colossus of Rhodes is probably one of my favorite game sequences to watch. Bayonetta’s boss collection all contained these statuesque faces with angelic names, making them more interesting for me to kill. Needless to say, I am a fan. And no, I never played Shadow of the Colossus, and yes, I know I should. In the meantime, maybe I will read up on Greek Titan mythology to ‘prep’ for my turn with Kratos. We are starting to gear up for our transcontinental trip to Boston next week…booked tickets to the Freezepop show for Saturday afternoon at Café 939. One week to go!